Is Shih Tzu Howling Got You Worried? Why is My Shih Tzu Howling? Does the sound of your Shih Tzu howling conjure up images of wolves deep in the forest, heads raised towards the full moon, making an eerily forlorn sound? Well, that’s what I think of when my sweet little Shih Tzu pack starts to howl, I’m reminded again of their ancestors in the wild. They begin and end their howling as if being prompted by a music director. Domesticated modern dogs rarely howl but when they do, it’s a sound to behold, especially if you have as many dogs as I do. But why howling? Why not barking, crying, whimpering, or yelping? This howling trait is a carry-over from their earliest ancestors, the wolves. Wolf howling has been scientifically studied, and it would seem that they howl at predictable times. It has been said that this ancient breed is more closely related to the wolf than many other breeds. Does that explain a Shih Tzu Howling? Wolves also howl to discourage others from encroaching on their territory. The pack will let any intruder know in no uncertain terms that they’d better back off. This area is taken. If a wolf in the wild gets separated from the pack, he is likely to howl with the others responding likewise. This is a typical wolf communication style. When social animals live in packs, families or pods, they need a way of communication and howling serves this purpose in wolf populations. Howling is a type of sound that can carry for miles. A lone wolf that has strayed too far from his pack will hear the howls and follow the sounds back to safety. 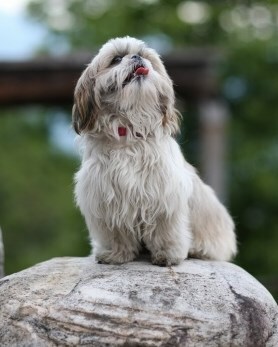 Are Shih Tzu Dogs "Wired" to Howl? Dogs still communicate, but their communication styles are different from wolves. Nevertheless, howling seems to be a modern throwback from earlier times in the course of canine evolution. Several explanations have been suggested for why modern dogs still howl as a means of communication. Dogs howl as a way to summon you. Dogs howl as a way of communicating with other dogs. You might hear one of our devoted Shih Tzu howling at the sound of a police, fire or ambulance siren. They have even been known to howl at these types of sounds playing on the television. The high pitch of a siren might sound similar to the higher pitched howls of other dog, and the dog’s instincts win out every time as they howl back as a way to communicate. One of the most surprising observations I have made when it comes to my “pack” of dogs is that their howling often sounds like harmony. Could they be singing? When wolves are in a state of high excitement, they will howl. It would seem that our domestic dogs do this too. People have reported that their dog howls when they start to sing. They are not trying to outdo your lovely voice, they just want to join your chorus. If a dog is howling for no obvious reason, he might be lonely or bored. It may be that the dog is just bored and wants something to do. He has eaten, walked, played, napped, and now he’s ready for some excitement, hopefully with you. Lonely, bored dogs often howl. Dogs seem to have distinctive barks and their process of howling seem to follow this pattern. Dogs that live with other dogs learn to recognize one anothers' barks and howls. Howling may be a way of “taking attendance.” “Are we all here?” “Anyone missing?” Where there are a number of dogs in a small area, such as in multi-dog households, howling might occur, regardless of the breed. But what explanation can we give for why small dogs like to howl? Are they trying to communicate also? The answer is undoubtedly yes. This is one way that dogs can communicate whether they are trying to communicate among themselves or with you. There is a couple of things you can do to help your pooch change their communication habits. Some dog breeds are more verbal than others. If your dog loves to bark and howl, an anti-bark collar sometimes works. These collars are worn close to the dog’s skin with the active part positioned right in front of the dog’s Adam’s apple. When the dog barks, the device emits a small vibration that gets the dog’s attention. It is not a shock as some people think, just a vibration such as what you feel if you have your cell phone set on vibrate. These devices are most effective when paired with behavioral training. Another method that is used to reduce howling and barking involves eliminating the triggers that set the howling in place in the first place. If you know that sirens are tested in your area every Monday at noon, plan on playing a loud song on the radio to drown out the sound of sirens. If you know that your dog is likely to howl when you put him to bed, consider what other doggie sleeping arrangements you can make for him. Perhaps he could sleep closer to you so he is not so lonely. If separation anxiety is at the root of the problem, consider making alterations that will treat the stress at the same time. Shih Tzu Howling can be cute or annoying to people. Just know it is one way your dog is trying to communicate with you.